BlackOut: Your character's super name. This should be the same as your login name. Unknown : Your character's alter ego's name. If your character has no identity outside his or her super identity this can be left blank. Hero: Antihero, Villain, Rogue, Oppressor, or Hero. Grimm City: New Carthage, Grimm City, or Silent Falls. Male: Male, female, or possibly asexual in the certain cases of alien or supernatural heroes. 5' 11", well built athletic, white hair, tan skin, icy blue almost white eyes. : Your character's height, physical build, hair color, etc. Anything which seems important in this area. 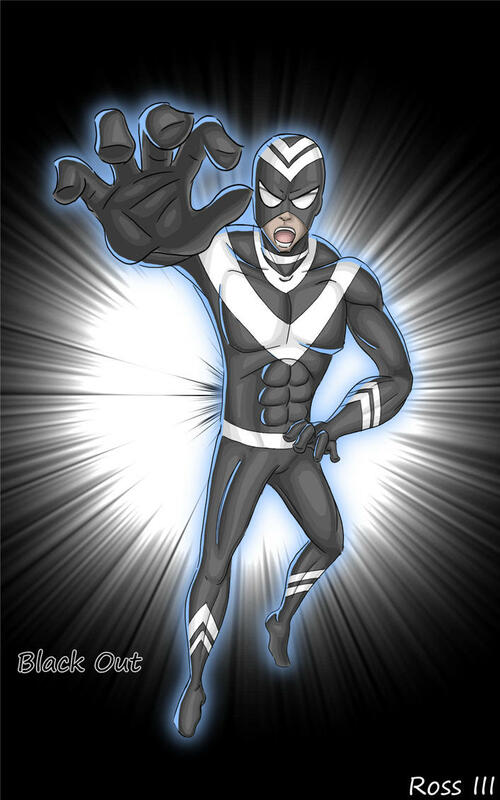 wheres a black stereotypical super suit with two V shaped white stripes on the head. a white band and a V shaped stripe on the neck. a large V shaped stripe on the chest. two V shaped white stripes on both four-arms and shins. sometime he wheres a pair of jeans instead of tights. no cape. mask splits at the bridge of the nose revealing his mouth and part of his nose. i tried posting a link to what he looks like but i have to wait 7 days. : Self-explanatory. Be as detailed as possible. Do not list any special properties of the suit here, this is just for appearance. At least 100 words. Black Out is kind of a shady hero and most people consider him a vigilantly. He considers himself a rouge, but he would give his life to save another. Black Out isn't quite sure where his powers came from; actually he isn't quite sure where he came from. One day he woke up in a ditch with no memory whatsoever. He discovered his powers when he saw a man mugging an elderly lady. He went up to the man, put his hand on the man’s shoulder, and the man fell to the ground. At first he didn't think anything of it. But whenever he made contact with someone, they fell to the ground as if dead, they weren't of course, just passed out. He exiled himself for a time, in which he learned to better control his bizarre curse. He trained his mind, body, and spirit, in his exile. He then, after he un-exiled himself, moved to an apartment in Grimm City, where he started using his powers to protect the innocent. After nearly being discovered a few times, he chose to make a surer suit and an alternate identity. And thus Black Out was born. He continues to look for information about his past, though he never finds anything out. All he has of his past is a picture of a smiling little boy, with dark hair and intense blue eyes, that resembles himself, minus the dark hair, that is. He is the man with no name no memory, and no allies. : Briefly give your character's origin story and some history. At least 250 words.